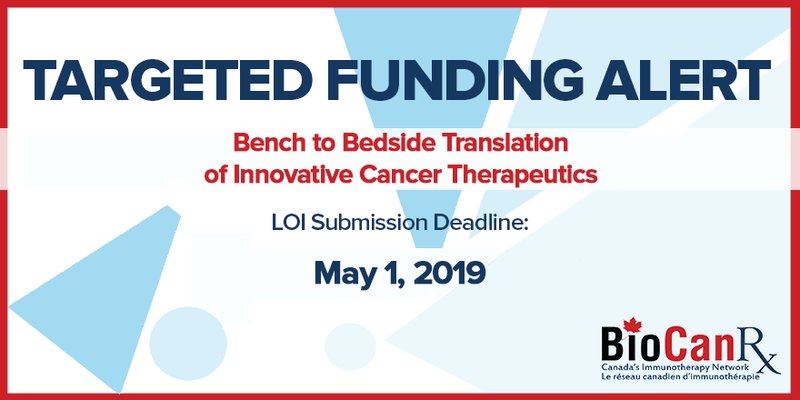 BioCanRx, Canada’s Immunotherapy Network, is pleased to announce its 2019 Call for Letters of Intent. Selected Letters of Intent will be featured in the Scientific Program of our Cycle II application going forward for review in July 2019 to the federal government’s Networks of Centres of Excellence (NCE) Program. Building on previous BioCanRx investments in Cycle I, the overarching goal of the Cycle II Research Program will focus on extending immunotherapy successes in the clinic beyond initial responders. To address this challenge, while making use of technologies in the BioCanRx pipeline or by soliciting new complimentary technology, BioCanRx will invest in projects aimed at understanding patient and/or tumour type limitation(s) and proposing improved novel therapies, trials, or combination approaches to overcome the identified limitation(s). Applications must be received by midnight EST on Wednesday, May 1, 2019 via applications@biocanrx.com.